Contribute to the Rotary Club of Gold Beach by bringing in qualified business and professional leaders who are interested in and committed to advancing the mission of Rotary. You can help us fully represent your community’s business and professional life. Use this form to propose a new member. you’ll be strengthening your club and ensuring its growth and longevity. Do it today! Qualified candidates for Rotary membership are adults of good character and good business and professional reputation, who held or have held an executive position with discretionary authority in any worthy and recognized business or profession. Active members must meet the above qualifications as well as live or work within the club’s locality or surrounding area. Complete Part A of the Membership Proposal Form and return the form to your club secretary, treasurer, or membership committee member for submission to the board of directors. Remember, don’t inform a prospective member of the proposal until after the board approves it. The proposed member’s name and classification will be published in the weekly bulletin for two weeks running. Club members may consider and file objections, if any within those 14 days. 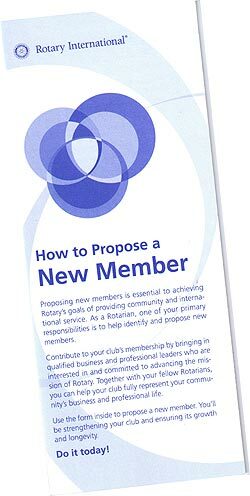 If no objections are received, the proposed member must pay the admission fee and becomes a Rotarian!! Welcome your new member!